1. If you’re using baking squares, chop them up into small pieces so they melt easier. I chop the butter up into small chunks too. 2. Okay, it’s not rocket science. Put it in a pan on medium heat and melt it all together till it’s smooth, creamy, and just looking at it gives you happy thoughts. 3. If you have leftovers (but let’s be honest, you’ll have to quadruple the recipe to have leftovers) then put it in an airtight container in the fridge. It will harden into a soft, gooey fudge like consistency. Then keep a spoon handy on the counter and dip it in every time you pass by. This serves the same purpose as the always-open bags of chocolate chips that Kate and I both have in our pantries. Don’t deny it Kate. Something else that might come in handy: The SINGLE SERVING. The tiny can of sweetened condensed milk. You find them not with the baking things, like regular sweetened condensed milk, but in the Latin Foods isle in a little six pack. They are PERFECT for all sorts of things when you don’t need a whole can. Each cute little can has 3.5 oz, which is 1/4 the size of a normal can. And it makes the most perfect single serving of this fudge sauce, so here’s the quantities for that! Just pop it in the microwave and heat in 45 second intervals until smooth! I love to put these into cute little jars and give them away as gifts. 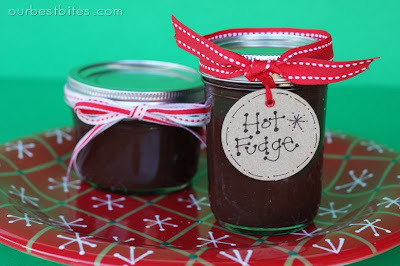 One year for Christmas I filled little pints with homemade peppermint ice cream and topped it with a jar of chocolate sauce and a big red ribbon. You could do the same with caramel (that’s buttermilk syrup aka caramel sauce in the bottom jar) how cute are these? It also works as a great quick and easy fondue! Wanna try some? Give me a shout if you’re a local and one of these is yours! This makes a darling Christmas gift! Storage: This is just fine kept at room temp for a day, but if you are going to keep it overnight or for an extended period of time, pop it in the fridge and just reheat in the microwave. Yeah, so I totally missed the part about it being within a 10-mile radius of you and I was like, “WOW! She’s going to SAME DAY SHIP ice cream and hot fudge sauce? !” And then I read more carefully. This looks so yummy. Thanks for the recipe! How about West Jordan? Does that count? What if I met you half-way? As for the sucking up part, oh, I mean show-the-love part, I only discovered your blog about a week ago, but I’ve read every single post since then and it is at the top of my list for favorite food blogs! You two ladies ROCK! Hmmm, I’m probably not within a 10 mile radius but I’m speaking up hopefully anyway! My dear hubby’s FAVORITE thing in the whole world is peppermint ice cream with homemade caramel, so I’m excited to try your recipe from yesterday. Might be a few weeks before I get to it, but it’s definitely on the list. Yes Kate. I take my ice cream condiments *very* seriously and will send it overnight during an emergency, lol. erin- you’re not under water are you?? I didn’t know you were in Iowa. owens d.c.- Dawn lives about 30 seconds from me, she should get her bum on here and claim some ice cream! Heidi- I don’t think I’ve ever tried peppermint and caramel together, but heck, how could it be bad? lol. Oh my word that looks so amazing, I know what I am making for Father’s Day!! Oh and I am so excited to claim my prize!! Bring it on you beautiful woman you!! Oh, I meant to add that there’s still one left. First come first serve! Well, I can’t qualify for the hot fudge sauce (though nothing beats homemade hot fudge sauce and this recipes looks divine), so you can be sure this comment is 100% sincere. (Not that that others aren’t!) I’ve LOVED this week on the Daily Bite. Homemade ice cream is one of life’s simple pleasures and I’ve eagerly anticipated checking your blog each day this week. I’ll be trying your recipes for sure! Thanks from one of those people you don’t know who reads your blog. Crap, Brie beat me to it!! 🙂 That fudge sauce is DEVINE!!!!!!!!!! Seriously, I will never buy the store crud again. SOOO GOOD!!!! Ahhh, Brie and Pyper were CLOSE! You snooze you lose Pyp, haha. Oh, and thanks Lindsay, we’re glad you liked ice cream week! You’re Carly’s sister, right? Whoa. I’m totally stealing your Christmas gift idea. If you want, I can give you credit when I hand out the gifts. “brought to you by The Daily Bite”. Pshhh.whatever…NOT FAIR! lol..just kidding. I knew Pyper or Brie would be all over that. Yes Lindsay is my sister. She’s the bomb.com! hahaha. I’m hilarious. I LOVE ICE CREAM!!! Uhhhhh, I thought the way you originally posted the recipe WAS for a single serving! Silly me! Now you need to offer a prize for the people who live more than 10 miles away because that is just not fair! Maybe you should send us a cool kitchen tool or a bottle of that smoked paprika??? 🙂 You know you love me BEST right??? I made this and it was delicious, but mine also had some chewy lumps in it. Is it supposed to be that way, or did I not stir enough, cook on too high of a heat, cook too long? I mean, I’m all for chewy lumps if that is how it is supposed to turn out, but for some reason I think I did something wrong. Any ideas what may have happened? What’s wrong with you Alison, you don’t like chewy lumps in your chocolate sauce?? lol. Most likely, the heat was a little to high and the sweetened condensed milk got stuck to the bottom of the pan. Then when you stir it, it gets scraped off and stirred into the sauce resulting in “chewy lumps.” I know because I’ve done that before! lol. Try using a non-stick sauce pan, and starting on a lower heat, or just do it in the microwave. Sorry, I’m a few months late, but I just found your blog. Do you have a recipe for the chocolate sauce? I totally want to do this for Christmas gifts. Also, where did you get those cute little jars. SO cute! You must have skimmed right over the recipe! It’s in this post. There’s also a recipe for a “just for one” chocolate sauce in there. And those jars are just made by Ball-normal canning jars. I got them at Walmart! Do you have a recipe for the caramel sauce or did I miss it? bz and laura- no don’t worry, you’re not blind! I had planned to do the two recipes that day, but I ended up just posting the chocolate. The caramel sauce is just a basic caramelized sugar + cream + butter, and I’ll put it up on of these days! I missed how many this serves and do you use the regular can of sweetened milk? i want to serve this on thanksgiving for 12 will it be enough? or should i doulble it and one last? can i add extra chips or should i make this to the T. I have tried other fudge sauces and pretty much given up until i read this and all your reviews! Do you have the recipe posted somewhere for the caramel sauce? 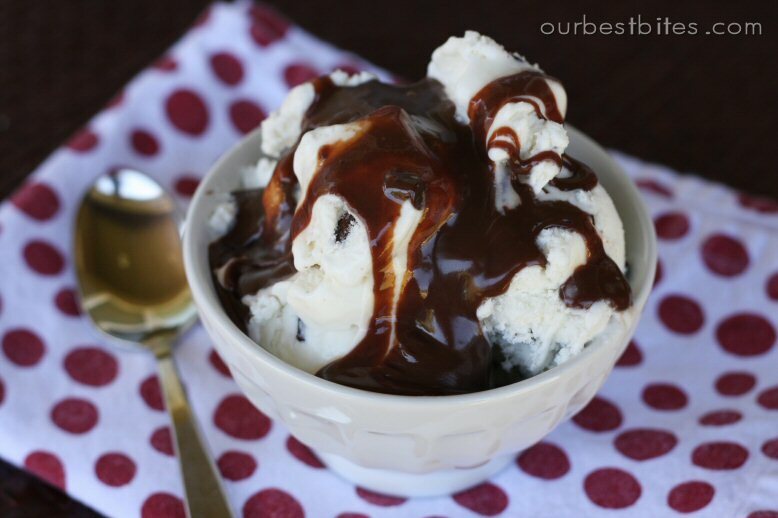 I love the hot fudge sauce, I've made it over and over and LOVE it! Thanks! Yum! Honestly anything with Sweetened Condensed Milk has to be good. Right??? Thanks, Love your blog! Just found your blog today…love it! Staying! Does baking chocolate include the unsweetened kind? Sounds delicious! I am in the process of making it right now! Could you please give us instructions on refrigeration, shelf life, etc? Thanks!! Mmmmm mmmmmm – that's some good stuff! Okay I notice everyone is asking for the recipe for the caramel sauce. I however would like the recipe for Puffed French Toast. I have the same question as a few others… If I give this away in jars, how should they store it? Would it work to store in the fridge and they can reheat in the microwave? Or keep at room temp? Same for the caramel sauce? I'm sorry, I keep forgetting to answer that question! I'll go add it to the post for future reference. Immediate refrigeration isn't needed for the fudge sauce or the caramel sauce. If they are going to be stored overnight or for extended periods of time, then pop them in the fridge, but they will be fine at room temp for most of a day. After being refrigerated this sauce will be thick and fudge like (try it with a spoon!) so just remove the metal ring from the jar and reheat in the microwave until soft again. I made a triple batch of this indescribable fudge today. I chose to melt the ingredients on the stove but the recipe is so easy and quick. I have already put them in the little mason jars for Christmas gifts. For now I will leave the jars in the refrigerator and when it's time to deliver these beautiful gifts I will put them in my little cooler and deliver them personally. One last comment;if you shop at Walmart you can make this so cheap. I used the El Mexicano brand sweeten milk and it's texture and taste was better than the more expensive brand. If I wasn't a diabetic I would just leave the spoon in the jar like Sara indicates she does! I will NEVER buy store bought chocolate fudge again because this tastes better than anything I have ever tasted. Any idea how many jars one recipe will make (the shortest ones)? Thank you! Were you able to find the short mason jars at Walmart also? If so how much were they? I'd also like to know how many jars you can fill with one batch – thank you! In answer to my own question and in case anyone else is wondering (or trying to work on a small budget, as I am), you can get the short jars (8 oz) in a pack of four at Wal-Mart for $3.79. Also, the recipe fills two of these jars. And in case you're wondering, you can get about 2 cups out of a regular size bag of chocolate chips. I had to purchase everything (except the butter) at regular price because I didn't plan ahead and the total cost per filled 8 oz jar was still only $2.01! Thanks ladies for helping me give presents to my husband's office friends without breaking the piggy bank! Trimble- you beat me to it! I'm glad you got everything figured out, sorry I wasn't able to get on here and answer your question sooner! Trimble -Thank you! That's exactly the kind of info I was looking for 😉 I'm now staring at 16 cute little jars full of hot fudge sauce! I just put all the ingredients in a glass bowl and popped it in the microwave and hit the soften/melt button and it worked like a charm. Tomorrow I'm going to hit Michael's to see if I can find some cute tags or stickers for the jars. Thanks for a great recipe! I just made a quadruple batch of this for gifts. Let's just say I'm going to have a hard time giving it away! It's so yummy. And so easy! Thanks for the recipe! I just heated up a couple of teaspoons of this suace and dipped my fresh strawberries in, YUMMY! thanks for the recipe. I saw this recipe and immediately thought of another i had seen awhile back, It is called Brigadeiro and you can make it almost the same way, The recipe calls for unsweetened chocolate powder and a full can of condensed sweetened milk as well as more butter, If you refrigerate it for an hour or so then form it into balls and coat it with chocolate crumbs or I always pour it over some cake instead of using a frosting. I just wanted to let you know, which I am sure you already do, that this sauce makes the BEST milkshakes! I am enjoying one right now. So yummy! You girls are awesome THANKS! Do you think it makes a difference if you do the baking chocolate vs the chips??? Which one is yummier, or does it come out the same? Also, does it matter if you use margarine or butter in these things? Do you think it tastes richer or different at all with the butter? I don't know what the difference is…. Angela- definitely use real butter. In fact, when cooking in general, unless margarine is specifically called for, you'll always get better results with butter. Enjoy! cool thanks. What about the baking chocolate vs the chips? im giving these as christmas gifts, and storing in Ball jars with lids… do i still need to store them in fridge till I give them away? Joelle- they're fine at room temp for a day or two. If you're going to be storing them longer then just pop in the fridge. I need to stop licking the spoon on this stuff…. I'm gonna barf LOL…. sooooo gooooooood:)You guys are right. Butter is way better. Thanks!! I just made a bunch of jars of this for giving away and found the cutest jar tags on Lolly Chops blog. The go right on the top and are adorable! Check it out and skip the drive to the store! !!! (MAYBE NOT A WORD BUT YOU GET IT…LOL) I HAVE ALSO TRIED THIS WITH WHITE CHOCO (BROWNIES AND STRAWBERRIES AND ICECREAM)AND BUTTERSCOTCH ICECREAM, THAWED PEACHESWITH VILILLA WAFERS CRUNCHED) CHIPS AND IT IS GREAT….THE BUTTERSCOTCH IS VERY SWEET BUT WITH SOME OF THE LESS SWEET VANILLA ICECREAMS IT IS JUST GREAT. I just made this! It is sooo good im not sure its going to last long enough to put in the fridge! 🙂 you guys are the best ever!! Not sure why I waited so long but now i have a new "secret" to bring to the potlucks! Thanks Ladies! how long does it last in the fridge for? a week? a month? a few months? auti and tim- definitely a week or two. Honestly I don't know after that- I don't know of anyone who managed to keep it for that long without eating it! Sara, I’ve wanted to try this recipe for a long time and finally got around to it today. I love how easy this chocolate sauce is to make and was also surprised by how far it will go. We dipped humongous strawberries into it and it was divine (of course, then I had to go work out for the second time today to make up for said divine-ness). I just made this sauce. Its great! However, I think I may have over cooked it. It doesn’t taste bad but its VERY thick! Next time I think i’ll take it off the burner sooner. Also, to answer the question about how much will it make, I filled two 8oz jars. I have some white chocolate chips, I’m thinking about trying that next! 🙂 Thanks for the great recipe. Yum! I made this over last weekend because I’d bought some peppermint ice cream and my husband thinks it’s too candy-ish and needed something to break up all the intense flavor. Well, this was the sure thing to do that! It literally was so easy to make and the best homemade hot fudge I’ve ever tasted! Thanks for the tips, it was nice that I had everything on hand too, no having to go buy heavy cream or anything like that. I actually doubled the batch too and the only reason we still have some in the fridge is because I don’t want my husband to realize how much I’ve eaten of it! I have to admit I’ve also sat and eaten a little warmed up just by itself, it’s that good. Thanks for the recipe! so if I add a little extract – like a teaspoon will it “ruin” the consistancy? I’m thinking some pepperment would be so yummy this time of the year. I just made this today and it is delicious! I added about a tsp. of vanilla and it made it so yummy. Peppermint extract I think would be just fine. I jarred it up and made a double batch so I have plenty to give away. I love the idea of giving it as a gift with a little pint of ice cream! Just made a quadruple batch for gifts and added 1 tsp. peppermint extract….it is DE-vine and didn’t seem to change the consistancy at all Thanks Kate and Sara!!! Made this for teacher & neighbor gifts this year. Brought peppermint ice cream with it to the neighbors & gave Braum’s (Ice cream store) GC’s to the teachers. I quadrupled the recipe & it was so easy & well received! I made this for Christmas gifts this year! Everyone thought it was the best fudge ever! I added some peppermint extract and it was divine!! Just made another batch for ourselves tonight….can’t wait to dig in! Thanks for another wonderful recipe! Made this with some homemade ice cream-another winner!!! The ingredients for this recipe can also be used to make a Brazilian dessert called “Brigadeiro”. Have you had it before? It’s so good!!! You just cook the mixture a little longer, cool, then roll into balls. Roll balls in chocolate sprinkles. Every kid’s party in Brazil has them. Just made this the other night and it was AMAZING!!! So quick and so easy and SO delicious! Will NOT go back to store-bought chocolate sauce again! Thanks for the great recipes!!! What happened to the peppermint ice cream link? WOuld love to make that for the holiday season to go along with this sauce. Want to make this topping to go over ice cream and brownies. planning on serving 200. Do you by chance know how many servings one recipe makes? I think it makes about 2 cups. You could make one test batch and see, but you’re just adding a little more to a can of sweetened condensed milk so you can sort of estimate it that way too. Have fun! Would it be possible to effectively seal or can this so that the jars could be kept at room temperature longer? I want to send this to someone as a gift and want to make sure it would still be good when they got it! No, sorry but this recipe is not formulated for canning. Where did you get the small jars and how do your sterilize, etc to prevent bacteria? Do you do anything special to prep the jars, sterilize etc tto prevent bacteria? I didn’t have any regular sweetened condensed milk on hand but I had picked up a chocolate sweetened condensed milk can on a whim a couple months back so I used that instead. The result? Amazeballs!